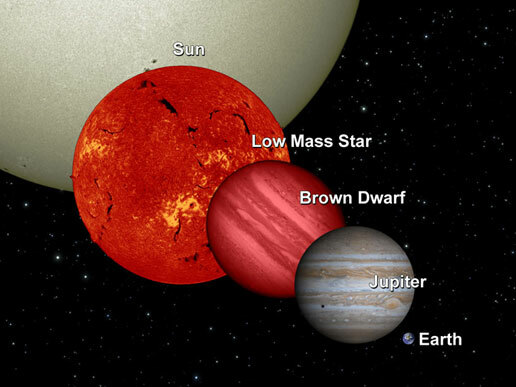 Brown dwarfs are a class of objects halfway between giant planets, like Jupiter, and stars. All objects with a mass greater than about 75 times that of Jupiter (7% of the Sun’s mass) are stars, and mainly burn hydrogen for their entire lifetimes. During this phase of peaceful nuclear combustion, their luminosity remains quite stable. Low-mass stars (less than 50% of the Sun’s mass) conserve the same flux for tens of billions of years – much more than the current age of the universe. Objects with a mass below this threshold (75 times Jupiter’s mass) thus inexorably cool, starting from a temperature of about 3000 °C, to reach ambient room temperature in a few billion years. Lighter objects (less than 13 times Jupiter’s mass) are called (giant) planets, while more massive ones (13-75 times Jupiter’s mass) belong to the brown dwarf class. Aside from this apparently arbitrary subdivision, brown dwarfs can be distinguished from giant planets in some other ways. For example, there are very few brown dwarfs in close orbit around stars, while this is very common for planets. In addition, there are many brown dwarfs in the solar neighbourhood (1 star out of 6 is a brown dwarf), while “orphan” (starless) planets appear to be much rarer. CFBDSIR 2149, a planet with no parent star, discovered in 2013 by researchers at the Institute in collaboration with French researchers, has blurred the line between planets and brown dwarfs, however. Generally speaking, brown dwarfs are isolated stars, and it is relatively easy to obtain a detailed spectrum for them. This is not the case for exoplanets located very (too) near their parent stars. Since brown dwarfs cool in the same way as giant planets and many physical phenomena governing their atmospheres are common to both, studying brown dwarfs is a way of constructing and testing atmospheric models that can also be used to study exoplanets. Researchers of the Institute, notably professors René Doyon and David Lafrenière, as well as researchers Étienne Artigau and Loïc Albert, have conducted and taken part in various studies of brown dwarfs, in particular efforts to detect brown dwarfs in the solar neighbourhood (e.g. 1, 2, 3, 4, 5, 6), study their variability (e.g. 1, 2, 3, 4), discover brown dwarfs in binary systems, both star/brown dwarf and brown dwarf/brown dwarf (e.g. 1, 2, 3, 4), and discover young brown dwarfs (e.g. 1, 2, 3).